Aur tamam Marketing specialization waloon ko offer hai ... if they need :) i m here to help u out :) InshAllah kuch na kuch tu aap ka bhala ho ga :). Not yet they are still asking to wait. Any one received security from VU. Needfull has been done. Will get resolved soon. Well they should mention the specialization, the certificate looks fake without it. Please solve this issue asap for the existing and newcomers as well, so that we do not face this issue in the future. Please All MBA students send email to VU management from their VU ID to solve this very hot serious issue regarding about degree. I am working as an accountant in Saudi Fal Company Limited Saudi Arabia. 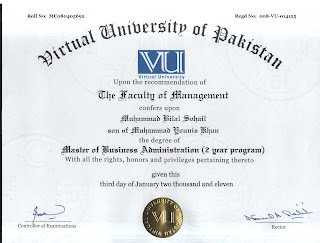 I did MBA specialized in finance from Virtual University of Pakistan, after getting this degree, I was suppose to promote as a financial statement analyst because the qualification for this position is MBA specialized in finance. So I submitted my degree to exalt my potion but Labor Ministry of Saudi Arabia has rejected my case with the comments "Candidate degree does not show he did MBA specialized in finance". All of other candidates whose got their degrees from India, Syria, Jordan, Philippine or Saudi Arabia are showing their subject specialization on degrees. Only VU degree is not showing subject specialization on degree. None mention of subject specialization on degree is a very big setback in my professional life. 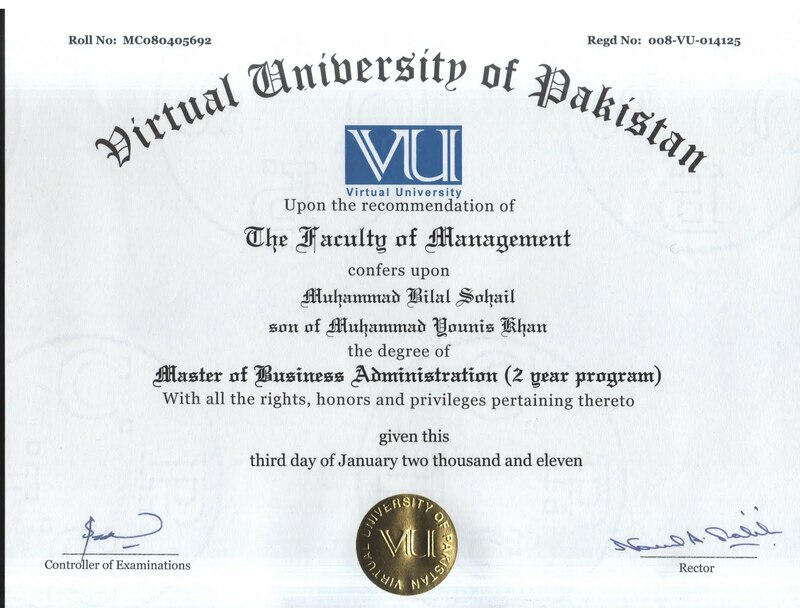 I would like to request to management of Virtual University to mention the subject specialization on degrees. It will be a great help for Pakistani students to compete with other candidates in Saudi Labor market. All Old and New MBA students kindly give concentration towards this issue. 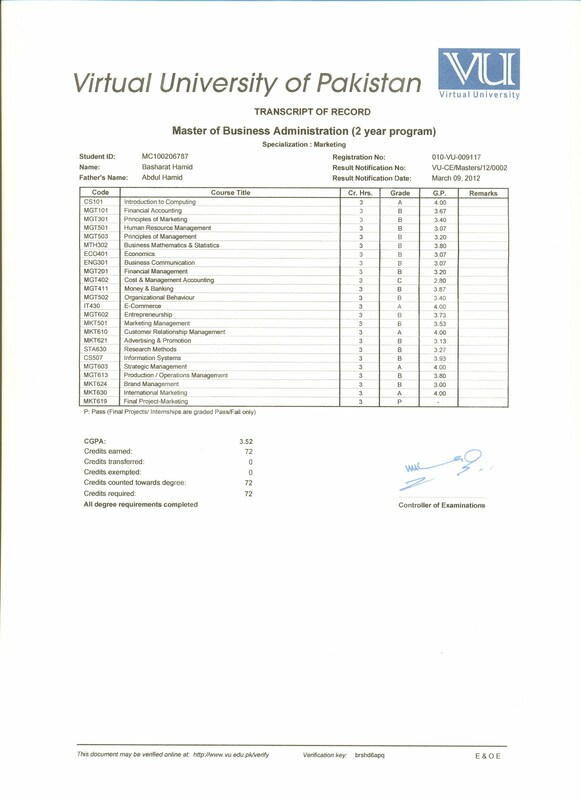 We want to mention our Specialization as well as CGPA on our FINAL MBA DEGREE. For this purpose all MBA Students send an email to VU Rector and Registrar so that they should do something regarding this. It's the matter of All MBA Students not only one person to please make contribution. I want to intend ur all intentions according to one issue...... 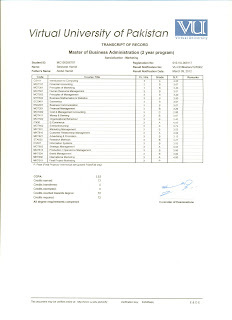 I have done MBA-Finance in last semester fall 2011. My Many friends receive MBA degree with different specialization Finance, Management, HRM, Marketing...ect. Ok i din wanted to mention but i have already communicated wid rector and he told me that this is academic council issue. He has already asked registrar to consider this element. Hopefully, we will see some refinement on this soon.